A violinist who straddled the divide between the old ways and the new was the Viennese virtuoso Wolfgang Eduard Schneiderhan. He was born on 28 May 1915 and beginning violin lessons at five, he polished his technique under Sevc�k and Winkler. From the 1950s onward, Schneiderhan displayed all the qualities normally associated with German musicians. He was scrupulously correct and serious about his calling: punctual, polite, always perfectly prepared. When he played, his attitude was unshowy and the music that emerged was shaped with a classical containment. He did his best to serve the composer by using a decent edition of the music and presenting it with due humility. This program, recorded with the American pianist Albert Hirsh, was issued by Deutsche Grammophon in 1958 on four 45rpm �extended play� records and receives its first release on CD. 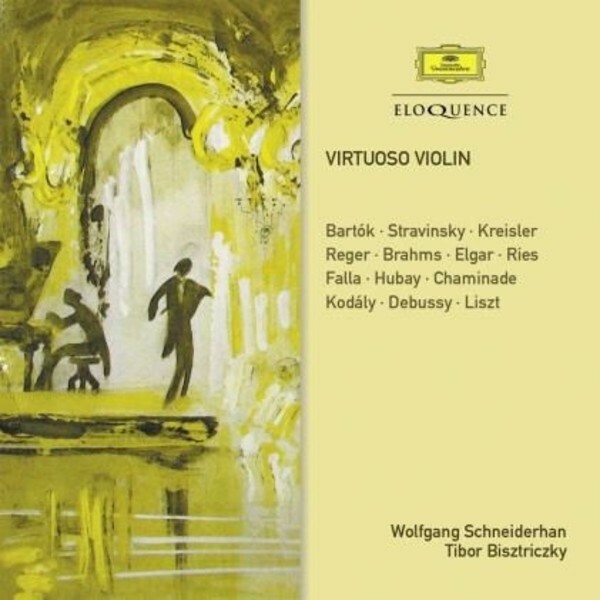 Also marking its CD debut is an extremely rare recording of violin encores (Chaminade, Debussy, Dvorak, Hubay, Kod�ly, Liszt, Rachmaninov, Tchaikovsky) by Tibor Bisztriczky, a typical member of the Hungarian school who was born at Arad, now in Romania, on 28 July 1908. He made few records, the best known being this ten-inch Deutsche Grammophon LP reproduced here, which changes hands for tidy sums. He was an excellent player who, as Tully Potter points out in his liner notes for this issue, had the misfortune to live in an era when Hungarian violinists were numerous.